The temperature in a slow cooker is ideal for baked casseroles. Flavors merge and mingle, the sauce has time to permeate every nook in every noodle, and a crunchy crust forms at the edge, protecting the interior from too much heat. The crust can burn, just as it does in the oven, so the timing is tighter for slow-cooked casseroles than it is for moist preparations, like stews and soups. You cannot leave for the day, unless you have a cooker that will switch to warm automatically. Most casseroles, including this classic baked rigatoni, can rest at warm for several hours without harm. Bring a large pot of lightly salted water to a boil. Add the rigatoni, stir once to moisten, and boil until barley tender, about 8 minutes. Meanwhile, heat 2 tablespoons of the oil in a large deep skillet over medium heat. Add the onion, celery, and bell pepper and sauté until tender, about 4 minutes. Add the marinara sauce, mushroom soup, salt, and pepper and bring to a boil, stirring often. Remove from the heat. Drain the cooked pasta thoroughly and stir into the sauce. Coat the interior of a 5- to 6-quart slow cooker with the remaining 1/2 tablespoon of oil. Put a third of the pasta on the bottom of the cooker and cover with half the Mozzarella. Repeat the layers and put the remaining pasta on top. Cover the cooker and cook for 2 to 3 hours on high, or 4 to 6 hours on low. Sprinkle the top with the Parmesan, cover, and cook on high for about 10 minutes, or until the cheese melts. Keep warm for up to 1 hour or serve immediately. 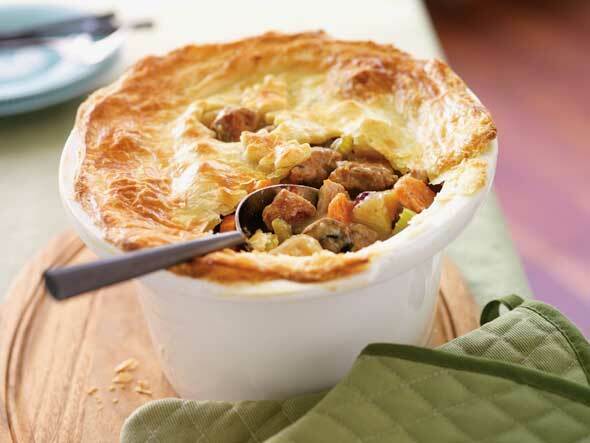 Pot pies are nothing more than stews topped with pastry. They tend toward the labor-intensive end of the convenience cooking spectrum, but the slow cooker (and the life-saving assistance of refrigerated piecrust) streamlines the problem areas dramatically. The real trick is the thermodynamic properties of slow cooker crockery. The crock of a slow cooker is designed to heat gradually and hold onto its heat for a long time. Because of that, you can top any stew made in a slow cooker with pastry, biscuit dough, or dumplings right in the crockery, and pop it in a hot oven to brown. The presentation is impressive, and the technique couldn’t be easier. Mix the flour, salt, pepper, and poultry seasoning in a medium-large mixing bowl. Add the turkey meat and toss until the pieces are thoroughly coated; pat off the excess flour and reserve. Heat 1 tablespoon oil in a large deep skillet over medium-high heat. Brown the turkey pieces in batches, about 2 minutes per side; do not crowd the pan, and add more oil if the pan should become dry. Transfer the browned turkey to a 5- to 6-quart slow cooker as it is browned. Add more oil to the skillet, if needed, and heat over medium heat. Add the onion, carrot, celery, mushrooms, and potatoes and sauté until the vegetables lose their raw look, stirring often, about 4 minutes. Add the reserved seasoned flour mixture and stir until the vegetables are well coated. Add the chicken broth and heat to boiling, stirring constantly, until the sauce is slightly thickened. Transfer to the slow cooker, add the dried cranberries, and stir so that everything is well mixed. Cover the cooker and cook for 3 to 4 hours on high, or 6 to 8 hours on low. Preheat an oven to 375°F. Roll the dough out on a lightly floured work surface. Remove the lid from the cooker and dry with a paper towel. Lay the lid on the dough and use it as a template to cut the dough in the shape of the lid. Roll up the edges of the dough all the way around so that the dough will fit neatly over the turkey stew. Remove the crock from the slow cooker and lay the dough on top of the stew. Cut several slits in the middle of the crust and bake until browned, about 25 minutes. Serve immediately. Make a homier version of pot pie using biscuit dough rather than pastry. Just make up a batch of your favorite biscuit recipe (it’s fine to use a mix). Roll out and cut to the shape of the crock or as individual biscuits and place on top. Bake as you would a pie dough. You can also go opulent by replacing the piecrust with frozen puff pastry; bake according to the package directions.